If this is the ex-Sammio body just taken over by MEV then it wasn't meant to be a full on replica. I don't remember them even using the Aston as the main driving influence, of course I could be wrong. As a tribute to the era I think it's a cool little car. As a Aston replica-ish, it's missing the boat on several levels. The Aston's lines are much more pronounced and exaggerated when compared to the Sammio and that's where the comparison is lacking. That said, I'd rock it for the right price and ease of build. I do see and understand why they made many of the decisions they did, leading to the slightly less than ideal proportions, as they tried to meet those ever present conflicting design goals which inevitably require significant compromises. Really it all boils down to the fact that to reduce price and assembly difficulty of these kits, they based it on the same concept as the Exocet...Take a Miata, pull the unibody off the front/rear subframes leaving the PPF in place between the two, drop pre-fabricated tube frame chassis onto Miata running gear, connected everything back to the new chassis, and drive it away. They've just now added a reasonably attractive body on top. The disproportionally small wheel arches allow the use of stock size Miata rolling stock to keep the minimum cost requirements of building one down. Same with the Miata like ride height. But just like any other Miata, the suspension can be lowered with readily available components. My biggest question is if the wheel wells might have been specifically left oversize too, such that they could be trimmed to work with common ~25" OD tires (vs the ~23" OD Miata tires) and then combined with said lowered suspension so that owners can give it more appealing proportions? Being stuck with a stock Miata wheelbase and smallish tire diameters, I do believe that the seating position is probably the visual lesser of two evils considering how small the wheels already look. Sure there are a few areas that it could still be visually improved in my opinion, even within the existing requirements. But as it stands currently, I think it's a good looking vintage styled kit when viewed as a stand alone product and is being offered at a good price for what it is. It's just not the full on DBR1 replica I think people were kind of expecting based on the initial information released. I don't remember them even using the Aston as the main driving influence, of course I could be wrong. The gorgeous fiberglass body has been faithfully copied from drawings, pictures and measurements from the original. Cheapracer, what ever happend with your DBR1 efforts? Ya, what happened with it? I applaud the effort that went into the MEV Replicar, but i agree the body is way out of proportion. Its a pity that they couldnt get it closer to the real shape. I wish i could find a cheap source for a DBR1 body or Jag D-type (short nose though a long nose would suffice) that is very close to the original shape. Then use Toyota Supra guts to make it a proper 6 cylinder sports racer. Ya Cheapracer what happ .. wait, what? Car things are on the go as we speak and ironically I just took a break from learning how to split the DBR1 body in 3D software and that's why I've been poking my nose in again recently and after seeing this version I am enouraged that there's room for an accurate replica. No slight on MEV's one by the way, Driven 5 covered what it is well enough above. To me this just digs into one of the major problems with the whole replica thing. If the replica isn't an almost perfect copy, the errors tend to really stand out. I suspect it's because the reality of the replica is conflicting the with mental image of the "perfect" original in our memory. I suspect that's why cars like the Fisher Fury don't receive this kind of backlash; there's no pre-existing expectations to be met. I agree with you 100%. My comment was directed at the "sorta-replicas" that tend to be "inspired by" or "designed to resemble" versus a largely accurate replica. There are some great replicas out there. However, I'm going to stand by my hypothesis that "loosely inspired" copies probably receive additional criticism just because there is a well known original to compare them to, regardless of the actual aesthetics and quality of the "loosely inspired" reproduction. This is a completely different execution, in that it's not made to fit a full Miata suspension, but it's a much better representation of the DBR1 body. Interesting comments. Allow me to elaborate. The MX5/Replicar wheel base is almost identical to the DBR1. The Replicar track width with the bolt on wire wheels is identical to the DBR1. The wire wheels bolt direct to MX5 hubs but are only available in 15"
The Replicar seat base is thick and sits on runners, the DBR1 is thin and bolted to the floor. The Replicar ride hight is currently set by it's standard MX5 springs. These could be lowered. The rear end is made to suit UK lighting regulations. The ASM car is registered incorrectly. The Replicar bonnet is taller than the DBR1 to allow for the MX5 engine position/balance. Making a car that is identical to the Aston Martin could open up a case of "passing off". The Replicar is not identical but the DBR1 design is not registered however so we are not concerned. I am 6 feet tall and was wearing an old polo helmet which adds a few inches to my height! Hope this helps you understand where we are coming from, sadly however due to high demand in the UK we are not able to take orders for export. One is on route to Arizona though. A full 6 page article will appear in CKC magazine next month which I am told will be available digitally. "Stuart is particularly pleased with the balance of the surface language." Nope it's speaking another langauge that I don't (want) to understand. Sorry, but that thing's UGLY. The DB version has some grace and beauty even tho it's not as pretty as the original, but this one looks like you just tried to find a way to cover up a 7 chassis. You have proven yourself to be incredibly competent to put both your money where your mouth is and get a car to people's hands. Just a thought; Slow down a bit, go peruse the better design forums such as http://www.productdesignforums.com/ and others where amazing talent is going to waste not to mention for small change. As William Lyons from Jaguar said, it doesn't cost more to produce a good looking car than a bad one - and you could do something stunning. Of course the sole reason of producing a mock up concept car is to gain potential customer feedback before considering putting it into production. I have received over 200 replies containing interesting constructive criticism from all over the world and that very feedback could shape the next MEV product. I am not sure that the comments re Monster on here have been useful but thank you anyway. 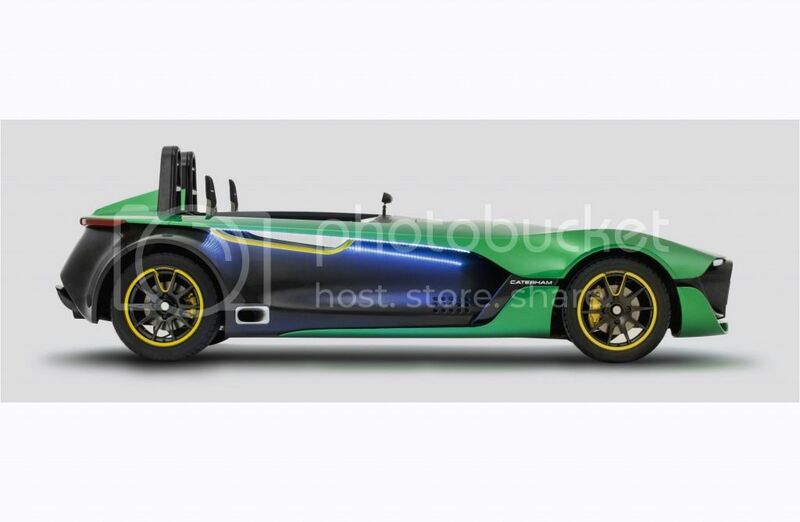 The latest Caterham concept based on a 7 is interesting, codenamed aeroseven, check it out. "I am not sure that the comments re Monster on here have been useful"
By that I'm presuming you mean, we didn't like it, and that's not what you wanted to hear. Location: 10 square miles surrounded by reality. I like the design. Also I would like to point out that the British have their own fashion sense, which I like also. The one thing that I would point out that everyone is overlooking is we should be happy that there is another car that is not like 99 percent of the vehicles out there. I really hate the fact that most cars look the same even across manufacturers to the point that I really cannot tell who even makes it. Think of it as this car is for a legs man vs. a (.)(.) man. Stuart, your Replicar has enjoyed a number of positive comments here, and I think they'd be more universally positive if not for the high expectations prompted by your earlier promos, which indicated it was a painstakingly accurate replica of a DBR1 body ("Faithfully copied from drawings, pictures and measurements from the original" as it said on your now closed Replicar site). Seen as a body to fit an unmodified Miata engine, PPF and subframes, it's a remarkable product, and unless one is willing to shorten the driveshaft and move the engine back, it's going to be difficult to improve the aesthetics of what you have here. I believe you have successfully dodged that bullet. I am not sure that the comments re Monster on here have been useful but thank you anyway. Yeah, we've been checking it out for a couple of pages now, see http://locostusa.com/forums/viewtopic.p ... en#p170340 and the styling has not received universal praise from our constituency. Even people who find your Monster unappealing will acknowledge that the Aeroseven proves you have no monopoly on ugly. You have so many designs, there's a favorite Stuart Mills design for everybody, but the flip side of that is that everybody has a least favorite as well. sadly however due to high demand in the UK we are not able to take orders for export. Sad news indeed. Perhaps the folks at Exomotive can do a Replicar makeover, a la their enhanced Exocet.